← Our first anniversary as fulltimers! I look out over Clark Canyon Reservoir from Camp Fortunate Overlook. Our campsite is across the lake from the overlook. The interpretive signs state that Sacajawea was reunited with her Lemhi Shoshoni people here, actually right in front of my campsite, at a place now under water. How happy she must have been to see her brother, Chief Cameahwait, after a separation of five years. Lewis and Clark stashed their canoes here. They traded for ponies and supplies for their trip over the Rocky Mountains to the Pacific Ocean. A replica of a dugout canoe. This historic reunion occurred August 17, 1805. Wait a minute! August 17th? Today’s August 17th! What a strange coincidence that I’m standing here over 200 years later on the very same date. Of all the days I could have driven up to this lookout . . . hmmm. Not even mid-morning yet, and already it’s hot. First thing this morning I take the crew down the lakeside road and let them out. They need some off-leash time to wander around. I take a few photos. The campground is in the background. After the jaunt through history at the lookout, we pass the $30 a night Thousand Trails campground ($15 with the member discount). Gee, at least they could put up some shelters. No shade at all. I don’t think they get picnic tables either. Driving across the dam we also cross the 45th parallel. According to a sign on the dam we are halfway between the equator and the North Pole. Okay. That was a thrill. Now what? Bridget and Spike are happy to go into their pen. They haven’t had a morning nap yet and it’s cool underneath our shelter. I get some iced tea and a book, set myself up beside them, and read. Sometimes I sit and watch the weekend boaters come and go, including a sail –er, motor — er, sail boat. Look closely … This guy believes in being prepared. The campground is filling up, as usual, for the weekend. Notice the smoke on the hills. “Helloooo? Excuse me?” I hear a lady calling me. I tell her I ordered it online from Mid-West Pets and give her some tips on how to pick the right one for her dog, which she hasn’t gotten yet. She and her husband are on their way back to Texas after visiting Alaska. We don’t talk long because her husband is in the truck with the motor running. She does mention how nice our shelter is before going back to their truck and heading over to the brutal sunshine at the pay campground. Heh-heh. And it’s free here. After two very cool days, today is hot. A Casita pulled into the campsite next to us last night. Ken’s Casita is a 2008. Ken from Utah is here with his son and granddaughter to do some fishing. The smoke is visible on the mountains. We aren’t aware of it here. Bridget and Spike sleep away the day in their pen. I read, watch the birds flying over the water, read and respond to anniversary wishes, and putz around doing very little. By email I receive word that the vehicle registrations were mailed yesterday, the 16th, so maybe they’ll arrive on Monday, the 20th. We have to leave this 14-day limit campground by Tuesday. I need to make a decision. Should the crew and I camp on the rivers, lakes, and mountains along the Montana/Wyoming border before moseying south through Idaho and/or Utah to our winter camp in southern Arizona? Or should we take a more ambitious route, heading west across Idaho into Oregon, all the way to the Pacific, eventually following the coast southward and turning east to Arizona for the winter? Dodging fire and smoke no matter which way we go. And if I decide to drive to the Pacific, what route should we take? Gee, woman, what’s the big deal? It’s not like you’re Lewis or Clark or something, blazing a trail through unmapped territory in the early 1800s! I don’t like the term “exercise pen.” Spike and I have never exercised in it, and we don’t plan on exercising in it ever. I’d like to share with you some of the things rvsue does to make our outdoor room more comfortable. You could use these tips with your dogs. Set up the outdoor room so there’s sunshine and shade. One thing I like is rvsue puts our dog bed in it. Spike thinks it’s his dog bed, but never mind him. She also folds up an old quilt and puts that in it, too. I like to scratch and paw around in that to make my own personalized nap spot. You know those carpet squares you can get at the dollar store? We have those scattered around so I don’t have to sit on stones or get my bottom dirty. Spike usually lies in the dirt. They also come in handy when it’s time to set up or break camp, because rvsue uses them to kneel on when she does the chains or puts the stabilizer jacks down. Oh, I almost forgot. Remember to put down a water dish for your dogs. If you want to throw some treats in, too, that would be nice, although rvsue NEVER does! 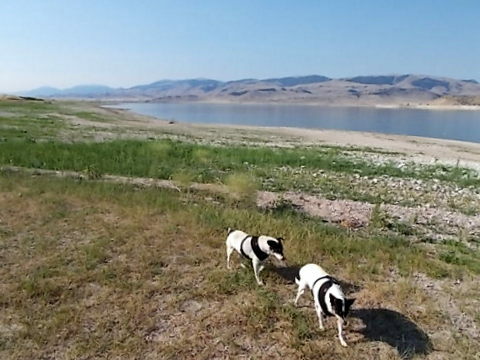 This entry was posted in Simple living and tagged Camp Fortunate, camping, Clark Canyon Reservoir, dog pen, exercise pen, Lewis and Clark, Sacajawea, Thousand Trails. Bookmark the permalink. 68 Responses to Camp Fortunate! sue, if you decide to go to oregon, consider the coastal hwy 101. it is a lovely drive and there are a number of National Forest campsites along it. plus wonderful places to eat with great food. the oregon dunes are an amazing site. I will warn you that it is rather cool here. warmer clothing a must. How cool? Would I need the heater on at night? Thanks for writing, Renette. Isn’t it exciting to have your own travel trailer? Ah, the possibilities . . . Thanks for the information, very helpful. Now if you could just get your Casita into that canoe with the PTV, you’d be all set to go canoeing, then you could land on the other shore and take off from there. Great photo. As for 101 along the OR coast, I recall driving it years ago in a van and being kind of nervous about all the twists and dropoffs – I don’t like heights. But the coast is beautiful. Another option is to go up into E OR and visit the Wallowa Mtns and Sumpter, a cute little town, and see some of that country, then head south through ID, if the fires aren’t right there in your face. Still very smoky in Moab, easily the worst I’ve ever seen it, even when we had some big fires really close. We’re looking at September. I don’t mind a little chill, but I don’t want cold and I definitely don’t want a freak snowstorm! Yeah, the fires are making my plans difficult. Hope it gets better for you soon, Chinle. Thanks – it sure makes for some wild red sun photos. I spent this afternoon, under the Casita, applying a rust paint called “One Step” to the frame; and, I am thinking about what is Sue doing today. She’ll be seeing/relaxing in a beautiful place and what am I looking at – rust. Oh well, it has to be done sometime – at least I can picture pretty places in my mind because of your photos, while am doing all this maintenance work. My day will come, Emily. I’ve got some maintenance jobs piling up, too. Be proud of yourself for getting that job done! That is odd that you were there on the date, 200 years later. 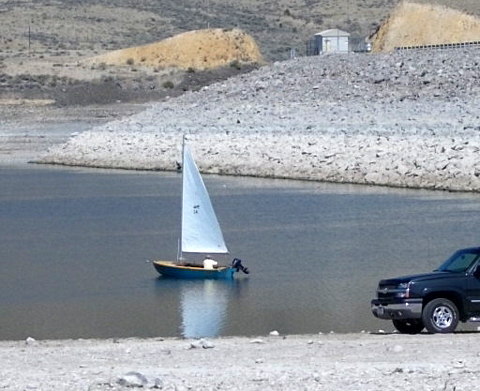 I cracked up over the picture of the sail boat with the outboard motor on it. Where are you planning to go in Arizona for the winter? I’ll go back to Ajo, for sure. 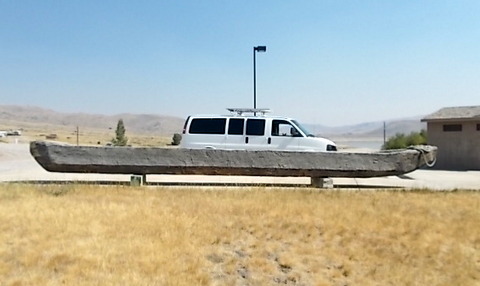 I love how Lewis and Clark made their dugout canoe big enough to ferry their van across the lake! And they were way ahead of their time with those solar panels! Funny! I wonder if they used their GPS unit . . . They did use their GPS unit. That would be Sacajawea … she named the device after herself (GPS). :)) BTW, thank you to the reader who suggested the You Tube “honey badger don’t care” videos; and, since you share your laptop with Spike, he might want to Google “puppies and porcupines” — as forewarned is forearmed! Have a good weekend y’all! Oh, Gayle, Every time I check for new comments and see yours again, I laugh again. Oh, my . . . . The coastal route is amazing but not sure about “free” camping any more. It’s worth it to cut back east just north of San Fransisco. Then you could catch Nevada and Utah. Bridget, you two don’t need nibbles outside to draw ants and critters. I’ve told Bridget about the ants, but her appetite is insatiable, beyond reason. I was wondering about cutting east just north of San Fran. Appreciate the input. I’ve cut east from Petaluma on 116 to Napa then to Fairfield and 12 to Lodi to avoid SF. Also further north from Calpella on 20 then 16. Good luck with the decision. Exploring the Painted Hills. She has several other entries of the area as well. So much to choose from so little time! He He, the best things in life really are free! Great information! This is very helpful. I’ll check out the blogs. We have made the trek countless times through the very pretty Blue Mts in Oregon…we used to live in the southern part of Washington state and our family was in the Boise Valley…GENERALLY, nights in Idaho are cool enough to need a sweater…even in summer. Days can be hot. That is my favorite way to get to the Oregon coast via Idaho. There are is an Oregon Trail museum, etc. on that route too. We are partial also to Le Grande, Oregon and Baker, Oregon. Beautiful spots also along that route. I-84 is the highway. Many scenic places along the Oregon coast!! Washington too, for that matter. Down into Northern California!! Just do not go wandering through the remote places in Southern Oregon/Northern California…it is a place frequented by pot growers, etc…we were rather scared when we ventured too far off the beaten paths and there were 4 of us in our car!! Back about 2000 anyway. I’m getting my Oregon Benchmark atlas out to look for the places you and others have mentioned. Thanks for helping me plan. Going to the Pacific Coast would make a great wrap-up of the summer adventure. Sorry to read on your blog about your mechanical problems. I’m impressed with the way you handle them (and repair shop people) with good sense and aplomb (whatever that is!). It looked like a great day for you and the crew. Well its cold here for the last few days and its August not October!! 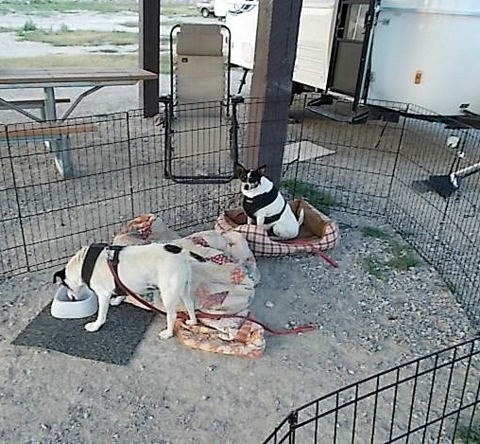 Stay where its warm Sue .. lol… I like your camping area a lot better then the one that you have to pay for.. Doesn’t look like they get much for 30 dollars a day.. Love the post from the Crew. looking forwarded to reading about which way you will head next. To bad you can’t post a map and put pins on it that would be cool, well for us northern people anyway lol. take care stay in the sunshine ..
People go to the pay campground for the electric and tv. I bet people coming to the reservoir think they need air conditioning so they pay out the nose for electric. These shelters are so well made and large that they provide a nice, cool area. I’m comfortable at night. I shut the windows to keep the warmth in. I forgot all about the video. Now I remember watching it before i picked up the BLT. I don’t have a long enough rod. And, you know, the way I’m raising and lowering them now, it takes about the same amount of time and effort. When my knees start to go, it’s good to know there’s another way to do it. Thanks for posting the link. I’m sure readers, especially newbies, will appreciate it. Hello, Sue…. Oh, I’ve got to get my expenses posted for July and August! I keep postponing it, having too much summer, I guess. How do I budget? I’m not formal about that. The way I live, my expenses are low and consistent. I anticipate expenditures for gas going way up during my summer travels so I’m miserly during the winter to offset that. I have a “buffer account” to handle the times I’m hit with repairs, replacing tires, medical, veterinarian bills, and other unusual bills. My main budget tool is simple: living well within my means. I’m going to try this year to determine an amount to have automatically deposited into savings, now that I have an idea of my costs. Nervous setting out? Setting up and taking down camp was easy because I had Paul and Reine (online friends) camped next to me and they showed me the ropes. If they hadn’t offered to help me, I would have asked other campers I didn’t know for help, so I wasn’t nervous. but I was excited to the nth degree! Dumping only made me nervous thinking about it, how embarassing it would be to literally mess up. Turns out I was all by myself, no one around, just desert, when I dumped the first time. Didn’t spill a drop (ew!) so that gave me confidence. Barney (Old Fat Man) gave me a tutorial a day or two before which helped a lot. Tank levels, easy… Backing up? I figured if I took my time, went slowly, I’d be fine. Problems with backing come from hurrying or worrying what other people will think watching you. If you concentrate on what you’re doing, it’s easy. I wasn’t nervous. I saw it as a challenge I was determined to conquer. Same with backing up. I mean, think about it, a lot of people do it and I can’t be dumber or more inept than ALL of them! Gee, this shoulda been a blog entry, it’s so long. Hope I answered your questions. I always figured that all that hook up stuff must be easy… cause guys do it. And if they can, so can I. 🙂 And I completely agree about all those helpful people waving their arms about. I ignore them (as I think… what the heck does that mean I wonder) and use my mirrors. I vote for Oregon – we also like the area around LaGrande and Baker. Some other OR spots we enjoyed are Silver Falls in Silverton, Crater Lake and of course, the beautiful coast. My daughter and her family camped at John Day in June, shortly before they moved back to the East Coast and enjoyed it. 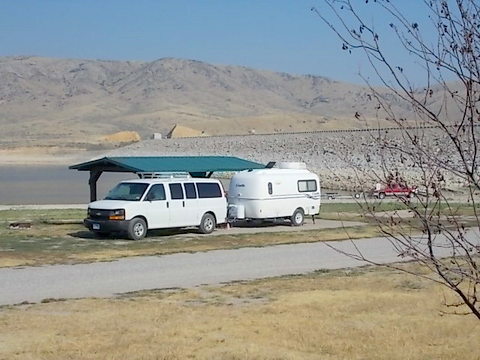 If you decide to go through WY, the Wind River below Thermopolis has some nice camping. And in Thermopolis itself is the Hot Springs State Park, an interesting place with free admission to the state-run bath house (indoor and outdoor). There are shady places to park onstreet nearby. Lots of helpful information, Marcia. Thanks. 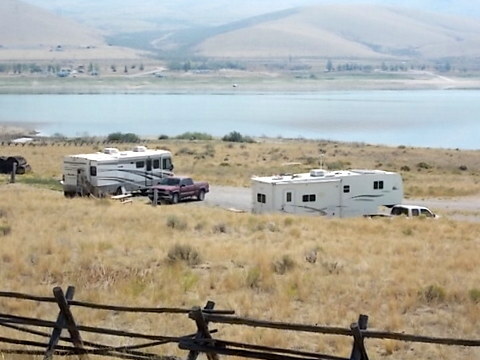 Larry, the guy I met at Brooks Lake who used to take “dudes” on fishing/hunting/trail trips on horseback, told me about two boondocking spots in the Wind River/Lander area. I won’t be in that area again this summer, although I want to go back to the Wind River again. It’s been some time since I checked in on you , Spike, and Bridget. I’ve just scanned through a lot of your travels and adventures to catch up. What a busy and inspiring summer! I’ve been busy dealing with a personal problem. Just a quick update. A Big (100 foot Pine) fell on our house on July 25th, during a violent, high winds thunder and lightning storm. I didn’t realize at first how lucky I was. The tree came all the way through and fell just on the other side of the wall from where Susan and I were sleeping. Another 3 feet to the left, and I would not be here to write this. Major damage to the house, we are safe and sound. We have about 15 more big Pines behind our place. All the Pine trees are mine. Can’t blame anyone else. Some will soon come down, or I’ll sue myself. Progress: we have an insurance claim in, the tree is gone, a contractor has been selected and work started. All our stuff and furniture is packed and stored away. We just found a house to rent near here while ours is being restored. Probably be out of our home 4-6 months. Should have hit the road like you guys did! Bob! What a close call! I’m so glad you and Susan weren’t hurt. What a big mess to have to deal with though. I had the pine trees taken out when I bought my house in Georgia. I left a big Leyland cypress. It was so pretty. Right before selling the house to hit the road, a wind blew that cypress down, missing the house about 3 ft.
Another blogger, Kimbopolo (do a search) had the tree-through-the-roof experience, too. I’m so thankful she, her husband, you and Susan, weren’t hurt. Keep on, keepin’ on, Bob! You’ll be fine in Oregon … probably though October … even in Eastern Oregon … no freak snow storms. Especially western Oregon — I live in the Willamette Valley & am VERY familiar with the coast… hardly ever snows there anyway. I would caution you, however, about the Oregon Coast in the summer & how crowded it is! I am not aware of a lot of free camping, but most campgrounds are pretty filled up this time of year. After school starts in Sept., “shoulder season” is a perfect time to visit. A LOT less traffic, easier to find a place to dock & the weather is still good. 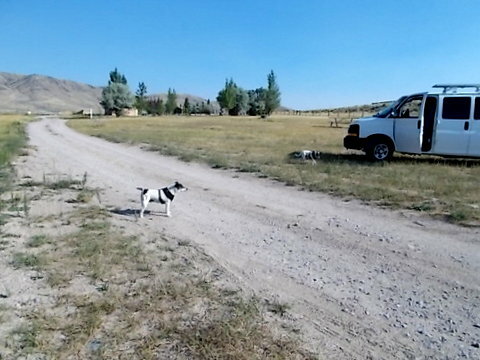 As for eastern Oregon, my husband & son have done EXTENSIVE “male bonding” trips with my father in law over that way & there are a wealth of very nice “primitive” camp ground areas that are free of VERY low cost & you can pretty much always find a site. Central Oregon, not always so much (easier access for day trippers/casual campers)… but the Wallowas, Steins etc. are pretty huge with lots of places to find a temporary home. My husband recommends anyone who visits that area MUST take the tram http://wallowalaketramway.com/ — there are lots of hot springs too if you’re interested in that sort of thing! You seem very knowledgeable. This is very helpful. Thank you and your husband, too. The John Day area is beautiful. There are some BLM campsites along the river in that area. $2.50/night with you Senior Pass. The Cascade Highway Drive outside of Bend is nice. We will be hosting 30 miles north of Klamath Falls at Collier Memorial in September and at Humbug State Park on the coast south of Point Orford in November before we head down to the desert in January. Maybe we will see you on the coast. 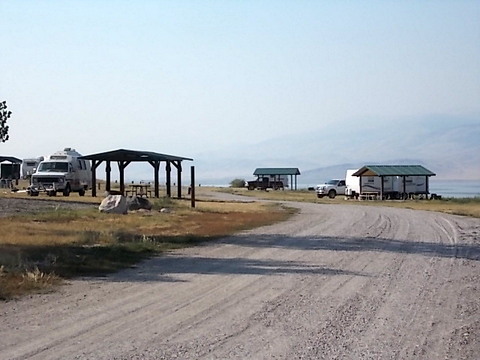 There are several USFS campgrounds in both areas. 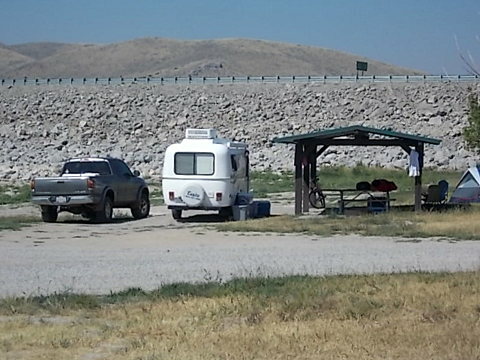 The USFS campsite one mile from Collier is free after they turn the water off in September with a free dump station and water located at Collier which is open until the middle of October. Quite a few of the USFS and BLM sites are like this. Hi, Bill, Ann, Julia, and Sammy! Hope everyone is well and happy . .. .
I’ve got my Oregon atlas out right now. Looks like you have landed two wonderful camp hosting locations. I’d love to visit both of them. Thanks for the information on camping fees, always a concern of mine. Now I’m getting excited and anxious to get back on the road again! Thanks, Sherry. I’ve browsed the site, very helpful. It looks like Oregon state campgrounds run around $24-$26 with hookups and around $10 primitive, of which there are few. Yup … that sounds about right … but my husband speaks lovingly of the little primitive campgrounds around that area where they camped (up to a few yrs ago) with my father in law’s “senior discount” for $2.50 / night or even free. Most of ‘me are “pay & display” where there’s no host & they said they often were nearly the only people in the campground … hauling a 13 foot 1953 Terry Canned Ham Travel Trailer! Sue, You know right now going south only puts you in more hot weather. Since you are full timing there is no need to do it all in one summer. If I were you I’d go over to I-15 and head north to Wolf Creek then pick up 287 north. I’d linger at highway 2 in order to have a day or so to do a day trip to east Glacier. Then I’d meander west on highway 2 to Kalispell before heading south maybe on highway 93. You could then cross western Montana and Wyoming off you list. You need time for the Pacific Northwest so next spring you could take the summer to do Oregon, Washington and maybe Northern/Western Idaho before heading back south. Yeah …. but not TOO early in the spring, Oregon’s still recovering from the winter & has been known to have a little surprise snow in May. The eastern & central part doesn’t even open up some roads until close to July ….. At Crater Lake, the north entrance is typically closed for the winter season (mid-October to mid-June). Not to mention …. the spring in western Oregon is generally wetter than the autumn (my favorite season in Oregon) …. I’ve heard from several folks that Oregon in the autumn is best. Heh…Crater Lake CAN have snow ANY day of the year…friends were there on July 4th once and got snow. We were there in July and it was downright COLD!! I’m a little nervous about going any further north this late in the summer. I’d like to revisit Brook Lakes and the Wind River another summer, so that will be the summer I spend a lot of time in Glacier area. Another vote for the Oregon coast and a suggestion. If you can work it in, I’m a big fan of the North Cascades Highway, aka Highway 20, from Twisp, WA to Sedro Woolley, WA. Wonderful mountains, lakes, & rivers. If you follow 20 a bit further west from Sedro Woolley, you end up at the ferry to the San Juan Island, yet another beautiful place. Too many choices, too little time! I’ll be tracing your suggestion on my atlas. Gee, so many choices, I can’t see everything. At least I’ll get an idea of what it’s like . . . for another trip in the future. Head west to the coast. I am located off Hwy 26 in Central Oregon at Ochoco Divide Campground. There hasn’t been any smoke and the weather is starting to cool off with temps in the 80’s during the day and cool at night. It is about 85 miles west of John Day. If you do happen to come this way be sure and stop at the painted hills just to the east off hwy 26. It is spectacular! Wow! I’m chompin’ at the bit to get going, Jim! Sounds great. I’d wait until September, head for the Oregon Coast. Take your time going down the coast–it doesn’t snow (or rarely) on the west side of the cascades–along the coast. I don’t know where to tell you to turn east as I was going north on 101 from San Francisco. Don’t miss the coastal redwoods. My dream would be to winter in Oregon and summer in Idaho. Don’t rush the coast. Don’t miss the Columbia River Gorge, Astoria which is further north, and all the wonders on the trip south. Rather than not see it all, I’d wait until I could. Just my opinion. I could always go back, right? I figure, at the rate I travel, I wouldn’t make it to the Oregon coast until September, as it’s already past mid-August and I’m still waiting for the durn registrations to arrive. There’s no way I can make a perfect trip out of it, there’s so much to see. Only you know how you want to travel, Sue. I like elevenfootrv’s 3rd option only I’d take back roads as much as possible. You’d have plenty of time to travel to warmer weather and back to Arizona to winter. Oh, I wanna go!!!! Born and raised in the SF Bay Area so I may be able to take you further than Hobo……IF you decide to follow the coast…Hwy 1 is VERY treacherous. Remember you will be on the “outside” ie cliffside (not for the faint hearted). One lane both ways with NO turnarounds..meaning if there is an accident ANYWHERE before the next town…you’ll have to wait..for them to clear it. Not like you can sightsee because you have to keep your eye on the road! Once you’ve seen the coast up in Oregon..it’s pretty much the same all the way down. Depending what you want to see and how far south you want to go………I would stay clear of Los Angeles because of the traffic. Hwy 101 goes N/S so does Hwy 5….the latter is quite boring unless you like cows/farmland and is mainly truck traffic. Donner? Tahoe? Yosemite? 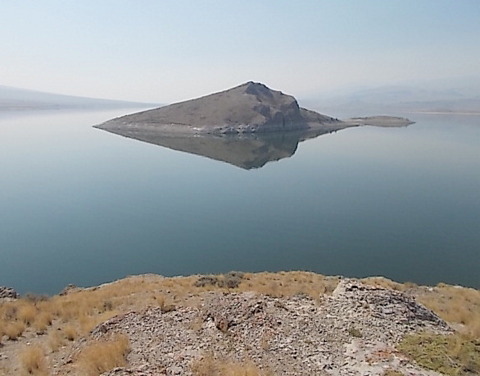 Mono Lake? Me? I would go East 80 to Utah and thru Utah toward Moab / Arches NP and down to AZ. Take 80 East to Salt Lake City? Someone told me to visit the coast and camp inland, rather than follow the coast on the 101. Sounds like you’d agree. Not for a second would I consider going near LA! Yikes! Are you saying go to Donner, Tahoe, Yosemite, and Mono Lake? Sometimes it’s hard to follow what people mean, being an Easterner and unfamiliar with where these places are. I didn’t know what you wanted to see on your way to AZ. Donner Lake, Mono Lake, Yosemite and Tahoe are all beautiful places. But yes, take Hwy 80 East, unless there is something more south you want to see, toward SLC and then go south. 80 East has little “gold rush” towns, rivers plenty of forest like places to stay. Being from Calee, there isn’t really anything exciting South past say Monterey. Pretty sparse on camping places also. Hope this clears it up a little. I drove 1 coming north from from Carmel up the Oregon Coast pulling my trailer. I did not get to see much other than an occasional glimpse and one or two pull-offs. My trailer is low profile, but I still had to watch the rock outcrops. I was glad I was going north, not south, though people do both. We stopped in Mendocino, then saw the redwoods, and on up. Unfortunately, I had my daughter with me so I was on a time schedule. If I ever get out there, again, I’ll never put myself on any kind of time schedule. What sue could do is camp along 5 and drive over to the coast in her tow vehicle. The Oregon Coast is no problem at all to drive, especially once the kids are back in school. Ha ha….funny you were on the inside. The first time I drove that highway South in a car I was freaking cuz it’s a long way down. Couldn’t imagine doing it in my RV or pulling a trailer! But I don’t like heights…or rather drops! 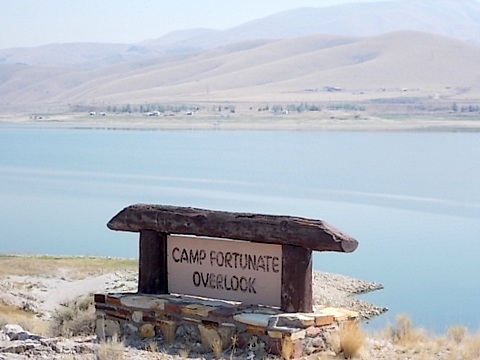 Funny that you would end up at Camp Fortunate on 08/17, the same time Lewis and Clark were there 200 years ago. It must be a place of good vibes/karma. Enjoying the Spike/Bridge blog. The crew have been rating you pretty well lately. Heard somewhere (probably on TV) that harnesses such that you have on the crew have a calming affect and also the exercise pen allows them to rest in a safe environment outside. Wyoming is a really cool place. Thought of moving there myself but the way you are doing it the best way, just keep moving on with the seasons and enjoying the moment and having the anticipation of the next adventure. You will never run out of places to go and things to see and experience not to mention all the interesting people along the way. Why can’t I get my act together and do this? Hi, Virginia, Interesting validation for the crew’s pen and harnesses. It makes sense. I wouldn’t want to live in WY any time other than summer. Well, maybe the time isn’t right for you to do this. If you want to do this bad enough, you’ll find a way. If I were going to Oregon coast my choice would be to start at Astoria (lots of history) and travel 101 all the way down the coast – allow lots of time to stop and look around so much to see and do!! I’m glad your comment finally made it through! I’m sorry for your trouble. I looked in my list of comments requiring “moderation” but it wasn’t there. It may have gone to spam because of the email address included. Lately I have over 300 spams when I check the folder, so I don’t always catch the legit comments buried in the spam. I will investigate each of the routes you outlined for me. I think I have to choose the least ambitious route as there is so much to do and see on the way from the PNW to southern Arizona. I appreciate the useful and practical suggestions. They help me a lot. One consideration I have is friends camphosting at Klamath Falls in Sept. and at Humbug SP in Nov. I would like to see them, if possible. Wow, this planning is a mammoth project! Thanks for writing all this and for the offer of help in the future. I am 60 yrs old..the ONE BEST YEAR of my life was lived in Coeu d’Alene, Idaho…nice people (still have friends there from that year which was 1966) and NICE people!! Not to speak of the drop dead gorgeous scenery. I STILL would love to live there again…so I don’t say a lot about it to anyone…hehe…too many people have moved in since 1966!! But this is definitely one place that one should see in Idaho…and there are other very pretty places too plus in my opinion the best overall weather I have ever lived in is in Idaho in general. Yes, can get hot, but usually cools down very nicely at night.